Table make up mirror, with 6 spots light. The robustness and the quality of Made in Italy, combined with a perfect light and small space required, make this mirror perfect for any professional requirements. This mirror with Cantoni design is the best choice to create a beautiful makeup corner for your professional salon or home furniture. Last pieces available for product catalogue renewal. The lighting system of the Cantoni makeup station range is the unique conceived and realised for the professional makeup artists: the I-light System illuminates the face with a uniform and neutral light without shadows. The mirror is easy to clean with a damp cloth, and, if necessary, adding delicate cleansing. The lit-up table make-up mirrors by Cantoni come from the reinterpretation of a classic object: craftsmanship and cutting-edge lighting technology, innovative materials such as methacrylate contribute to the creation of elegant, functional mirror featuring a lighting system ideal for professional make-up and skin care. 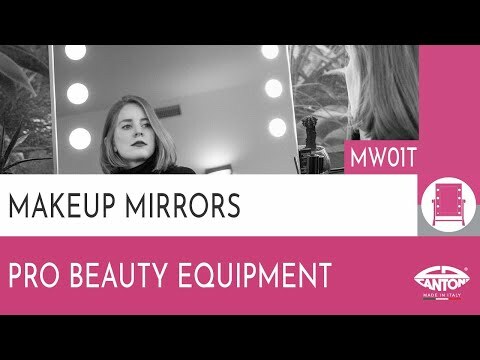 Born to decorate beauty spaces, the table mirrors by Cantoni are perfect to set up the training rooms of schools and academies for professional make-up artists.